Rumor has it that Bulgaria’s red wines are much better than it’s whites. That might be true. However, this does not mean that Bulgaria does not produce good white wines. In my search for excellence, I have come across a number of very good white wines, three of which I will present to you today. 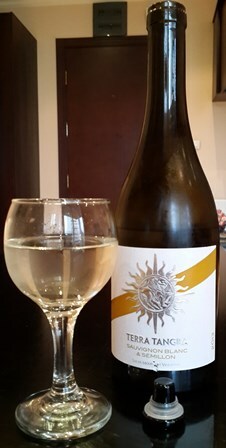 The first wine is a 2013 Sauvignon Blanc & Semillon by Terra Tangra. The wine is under a glass enclosure which signals to me: this wine was worth to be enclosed by the most expensive stopper. Terra Tangra is located in the South Sakar mountains, a hot region. According to the DiVino Guide from 2014, the estate has about 400 ha under vines. If the grapes for this blend come indeed from a rather warm wine region, the more I am amazed by this wine. It has all the quality traits inherent in such a blend. The acidity of the Sauvignon Blanc is mitigated by the Semillon. It reminds me of similar blends from the Hunter Valley in New South Wales, Australia. This is one of my favourite wines, very good with seafood but also just on its own, a great wine. 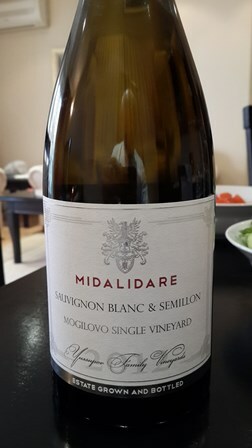 The second wine I want to present to you is another Sauvignon Blanc & Semillon blend, this time by Midalidare Estate located in Eastern Thrace, another wine region famous for its red wines. The region has very fertile soils, and is famous for its orchards and vegetable production. Eastern Thrace has a long history of wine making. In recent years also the white wines from the region have improved in quality. Midalidare Estate has about 160 ha under vines. I don’t know what to make of the “single vineyard” (Mogilovo vineyard) indication on the bottle. However, I like the zesty taste and the exuberance of the wine. The third wine is something quite different. I would not have thought that I find a wine made from Traminer grapes so appealing. This one is the big exception. The DiVino wine guide awards him 88 Parker points! It is clean and crisp, a wonderful sensation on the palate. 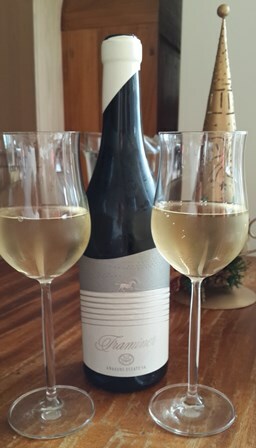 The top of the Traminer bottle is covered in “white wax”, again a sign for me that the producer thought the wine good enough for an expensive enclosure. Angelus Estate is also located in Eastern Thrace. Their first vintage was in 2009. The flagship wine is a 92 point red, called “Stallion”. Alexander Kanev, the wine maker impressed the wine fraternity with the outstanding quality of his wines. Also this winery is not small by German standards. It has about 110 ha under vines. Stay tuned to more news from Bulagaria. I hope to visit some of the wineries (maybe in spring) and show you photos of their environment and the vineyards.